Just a quick post, as most of my writing energies are directed towards a couple of entries for the Bridport Prize (only a week to go if you're planning to send anything that way). But, anyway, I'm in this month's Writers' Forum (issue #140), in Sally Quilford's "Reader Success" column. Back at the beginning of the year, Sally put out a call to anybody who'd won a prize in a writing competition. At the time, I'd just won the H.E. Bates Short Story Competition, so I thought I'd try my luck, and sent her an email. I was very pleased to hear she'd picked my response as one of the ones she would feature in the magazine. 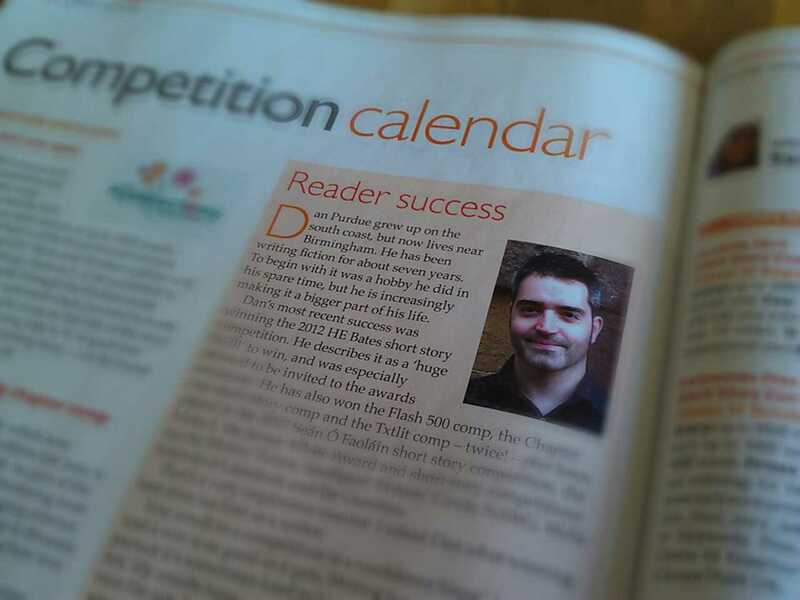 Anybody who's followed this blog for a while will know I'm a fan of competitions, so it was a pleasure to talk about how comps have encouraged me to experiment with different styles and genres, and how getting results in a range of different contests has boosted my confidence. And it's always good to get your name out there; you never know who might be reading. NB There's a small error, in that a couple of the competitions I'm listed as having placed in only netted me a shortlisting (the James White Award, and the Southport Writers' Circle and NAWG competitions).